Looking for the perfect gift to give friends and loved ones? 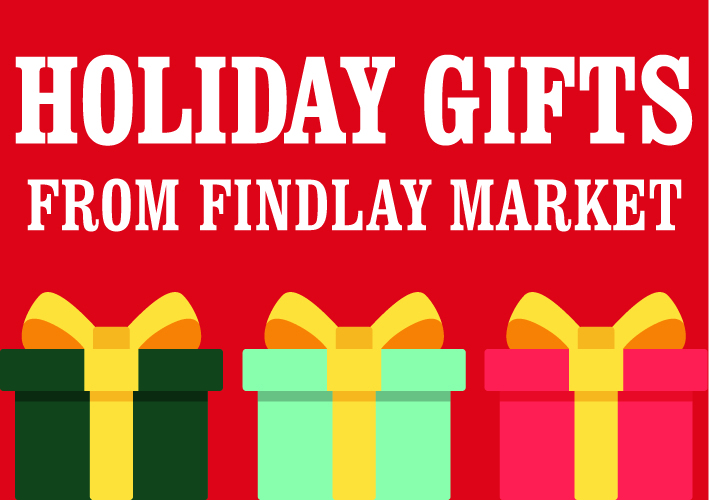 Look no further, as Findlay Kitchen now offers gift certificates for classes! Select the class for them, or let them choose, either way it's a unique and interactive experience that's sure to be tasty and fun. Visit https://findlaykitchen.org/classes/ to view a full list of classes. Artichoke - Mason Cash color mixing bowls (as seen on Downton Abbey and the Great British Baking Show; make great salad and serving bowls also), starting at $19.99 and Wüsthof 6-piece Knife Block special with bonus Kitchen Spoon, $199 (reg $249). Bee Haven - All natural Hand Salves in a variety of scents, .5Oz for $2.50, .75Oz for $3.50, 1.5Oz for $6.25. Bouchard’s - Sauces for aspiring chefs including pumpkin alfredo, alfredo, marinara, bolognese, vodka cream and many more all for $6! Catanzaro Family Produce - Holiday Baskets can be ordered and Findlay Market and picked up at The Newtown Farmers Market. Baskets are fully customizable and include items such as wine, cheese, crackers, jelly, nuts and more! Colonel De Herbs and Spices - Buy a $50 gift card get a $5 gift card for you! Holiday spices available! Vanilla Sugar for $1.23/oz, Fireside Mulling Spice for $3.75/oz and Harvest Moon Mulling Spice for $3.50/oz. Deeper Roots Coffee - Buy the coffee lover in your life a subscription to receive two 12oz bags of coffee from Deeper Roots once a month for three months, starting at $110. Dojo Gelato - Grab a gift card for the person in your life with a sweet tooth! Dorsa Studios - Beautiful handcrafted sterling silver necklaces for $55-$65 depending on size, each necklace is one of a kind. Eckerlin Meats - Have a lover of goetta living out of town? Call Eckerlin Meats at 513-721-5743 to order and ship goetta! Harvest Pizzeria - Gift certificates buy $100 worth and get $20 for free. Mt. Kofinas Olive Oil & Vinegar - Set of two 3.4 Fl. Oz. bottles for $13, pairs vary to allow for a variety of gift options! Madison’s Grocery - Small batch roasted Italian Chestnuts for $9/LB. Mama Lo Hizo/Mama Made It - Bags of kettle corn for $5. Flavors include Sweet & Salty, Cheddar Mess, Caramel Glazed and Chicago Style kettle corn. Market Wines - Wine Gift Bag, including one bottle of red, one bottle of white and a gift certificate for two wine tastings. Maumee World Trade - All natural soap for $3.50 a bar. Available in scents Cinnamon Citrus, Mint Creme, Orange Groove and more! Maverick Chocolate - Truffle gift sets, 6 truffles for $17, 12 truffles for $32, 24 truffles for $64. OTR Candy Bar - Holiday gift box with a bottle of wine or bourbon and a variety of candy. Pet Wants - Mini holiday gute bag including a toy, beef jerky, paw wax and skin spray for your furry family members. The Rhined - Gift cards available for all amounts, and special Holiday Boxes including cheese and accompaniments. Taste of Belgium - Gift cards available for all amounts, sets of waffles also make for a tasty gift!